The Islamic State (IS) affiliate al-Furat Media released a video on March 14 featuring a Bangladeshi man who identified himself with his Islamic name, Abu Maruam al-Bengali. In the video, al-Bengali calls upon his Muslim countrymen to carry out domestic lone-wolf attacks throughout the South Asian country. Meanwhile, there have been reported a series of attacks by Bangladesh Islamist militants linked to groups such as the Neo Jamaatul Mujahideen Bangladesh (Neo-JMB) in the month of March. Additionally, several encounters between security forces and members of these groups have been reported during nationwide operations to dismantle their cells, particularly in the peripheral border divisions of the country. The raids on Islamist militant cells and training facilities in areas like Chittagong and Sylhet Divisions indicate that these groups appear to have been in the process of upgrading their operational capabilities in terms of explosives. This has been evident in the recoveries of explosives material such as hydrogen peroxide and acid, typically used to make the more volatile IEDs involving triacetone triperoxide (TATP). Additionally, the cells functioning as production units for these explosives appear to have developed covert distribution channels to funnel them to militants across their division as well as those in Dhaka Division. In response to these attempts to upgrade operations and stage more attacks, IS is likely to increase its recognition of local cells’ efforts in the form of claims and the reporting of these incidents through their media, similar to what was witnessed in the aftermath of attacks in Dhaka on March 17 and 24, and Sylhet on March 25. 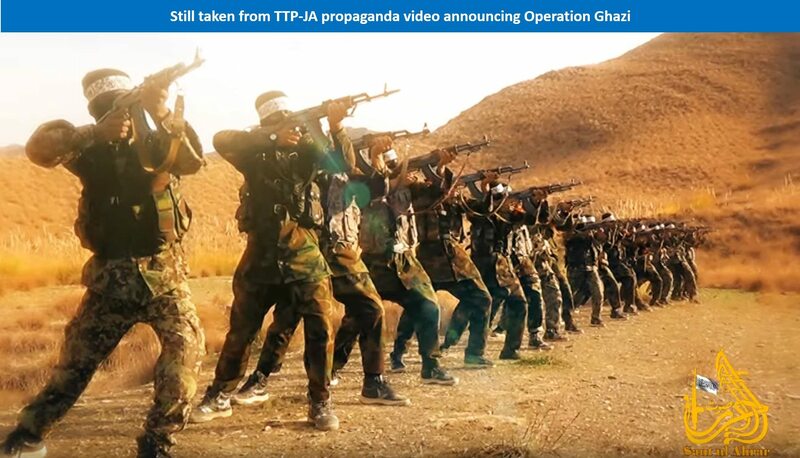 Further, the release of the video, specifically calling for lone-wolf attacks, suggests that IS has not yet developed a consolidated, formal presence on the ground, as the need to call for such attacks suggests that they are unable to set up more elaborate networks. Therefore, while IS may not have an established a physical presence in Bangladesh, its high command appears closely aware of Islamist militant incidents in the country, as a part of its pivot to new territories outside the Middle East. 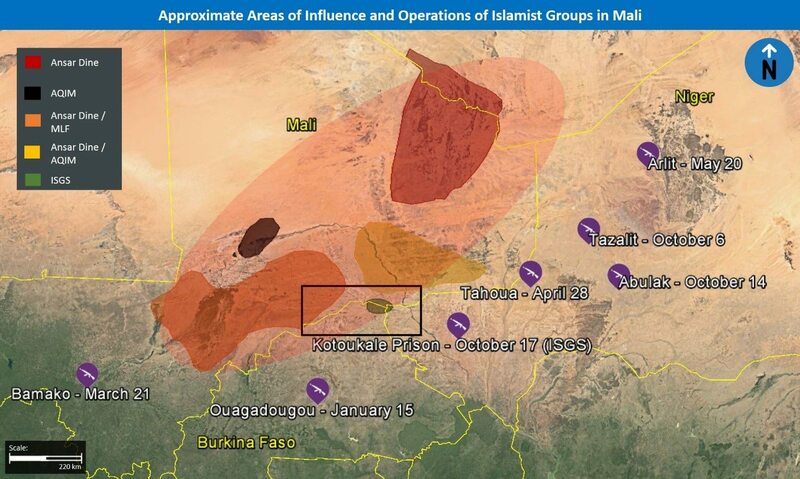 Additionally, IS will likely continue to rally domestic militants to carry out its strategic agendas through the validation it provides in its media for these operatives’ local attacks. 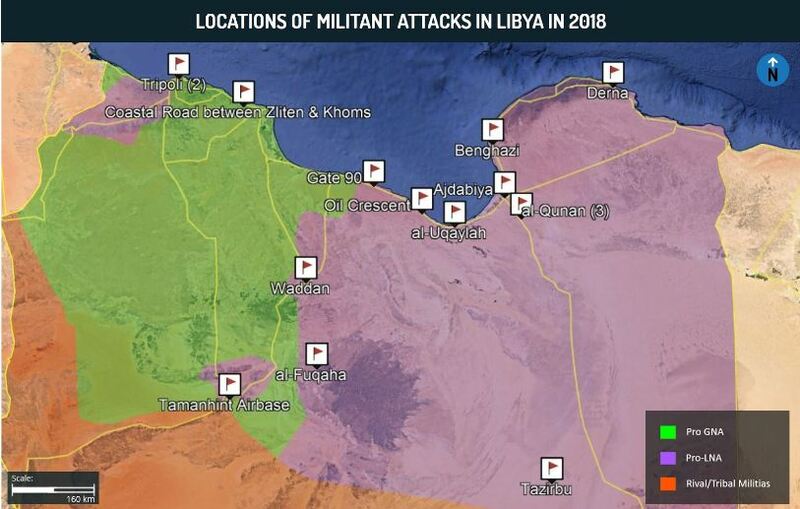 Given the publicizing of the two most recent operations, overlapping in their occurrence, the frequency of counter-militancy raids is likely to visibly increase in the coming weeks, both to stymie the new wave of attacks and as a means to project a proactive, offensive posture. While such raids may take place in peripheral areas across the country, a number of areas are of particular concern. 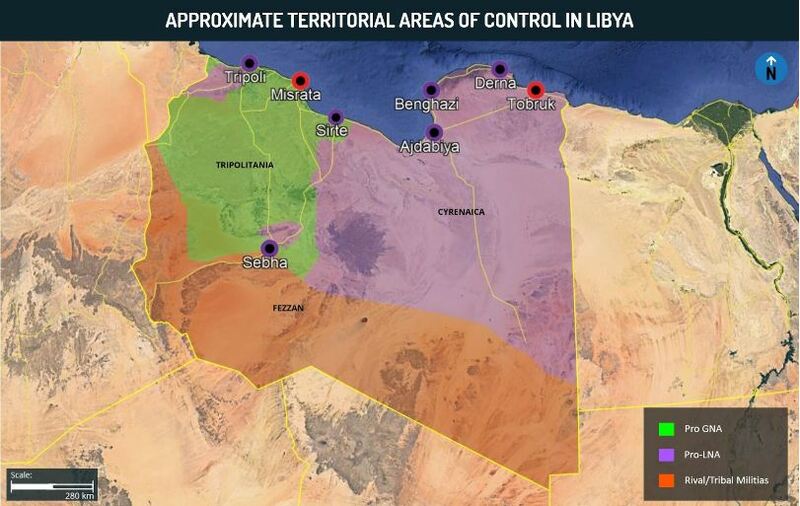 Northern, outlying regions of the country remain under elevated threat of attack and counter-militancy operations, given the presence of minority groups and a perceived high adherence to conservative Islam within local communities. The threat is especially pronounced in places of recent incidents like Sylhet, as well as areas where a number of attacks took place during previous waves of violence like Rajshahi, and Rangpur. 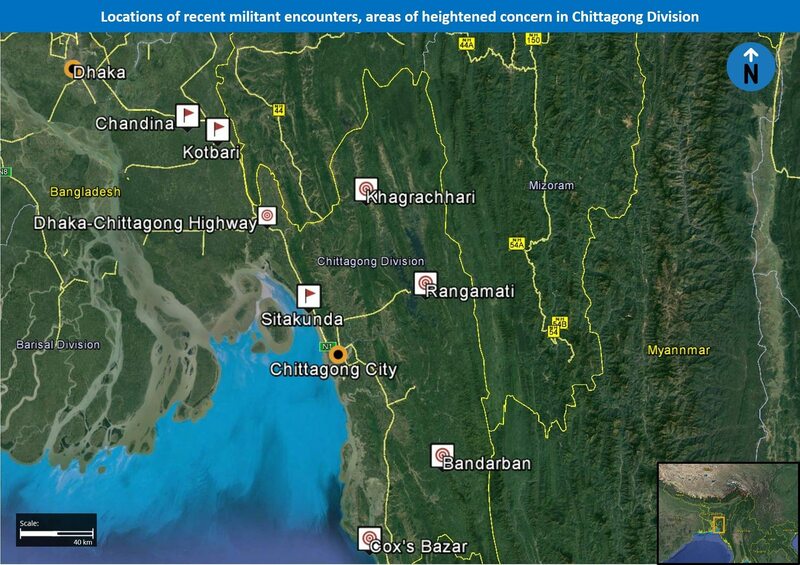 Further, in light of the hideouts in Chittagong, which were the most fortified and well-equipped dens uncovered in the recent past, it remains likely that JMB and other militant groups have developed a number of sophisticated hubs in the region, whose hilly geography would provide ample cover for planning activities. As such, additional operations in Chittagong are likely to take place in nearby areas where other similar groups may be planning activities, including Cox’s Bazar, Rangamati, Bandarban, and Khagrachhari. Despite increasing evidence that IS maintains some degree of involvement in Bangladesh, the government is likely concerned that admitting it would have a negative impact on the country’s economy, especially on the garment industry, which accounts for a staggering 80 percent of total exports. These concerns were similar following the Gulshan attack when a number of multinational garment companies operating in Bangladesh voiced their concerns over the volatile security out of Bangladesh entirely. By posing the issue as a homegrown, domestic issue, it denotes a lower level threat compared to that of transnational militancy. Additionally, the presence of Neo-JMB and even non-militant Islamist groups like Jamaat-e-Islami (JeI) serves as an adequate enough pretext to crackdown on any suspected Islamists, regardless of their actual affiliation. Security operations in March highlight this focus, with the majority of the militants, arrested reportedly members of Neo-JMB. This serves to the benefit of the current administration, as such groups are largely comprised of former opposition activists, vehemently against the Awami League-led government. While the labeling of such groups is relatively semantic, under the current narrative the government can place the blame squarely on domestic militant groups it often conflates with mainstream political organizations. While the majority were from JMB, at least 2,100 were reportedly leaders and activists from the Bangladesh Nationalist Party (BNP), the Awami League’s main political opposition. While in the short-term playing down transnational militancy may serve to appease foreign investors and improve the political standing of the current administration, in the long-run, it may also have unintended consequences, particularly as the links between IS and domestic groups become increasingly more difficult to deny. Firstly, the denial may serve to corrode the government’s credibility in defining the current narrative. As international media outlets and independent analysis increasingly highlight alleged links between transnational groups and domestic Bangladeshi militants, even supporters of the Awami League may begin to doubt the plausibility of the government’s stance. Further, Bangladeshi society has a multitude of Islamist camps, which maintain varying degrees of sympathy for the groups that are often targeted by the government during crackdowns. Perceptions of unmerited mass arrests against such organizations would likely serve to alienate conservative and even moderate Muslims that maintain pro-Islamist sentiments. Ultimately, this would serve to improve militant recruitment in the country and encourage additional lone-wolf style attacks, further actualizing the Islamic State’s original March 14 call. Travel to Dhaka and Chittagong may continue at this time while adhering to stringent security protocols given the threat of militancy, crime, and reports of violence from political rivalries. Those operating or residing throughout northern and southern areas of Bangladesh are advised to maintain heightened vigilance, especially in the aforementioned areas of Chittagong, Rajshahi, Rangpur, Sylhet, and Chittagong , given the elevated threat of both sophisticated and unsophisticated attacks, as well as an uptick in counter-militancy raids, which often result in civilian casualties. Given the continued threat of militant attacks against foreign nationals and interests in Bangladesh, foreign nationals, and especially Westerns, are advised to maintain a low profile, avoid travel if possible at night, review security procedures, and maintain heightened vigilance throughout the country. In their November publication of Rumiyah Magazine, Islamic State (IS) dedicated an entire article encouraging lone-wolf vehicular attacks via load-bearing trucks, similar to the Bastille Day attack in Nice, which killed 86 and injured hundreds. 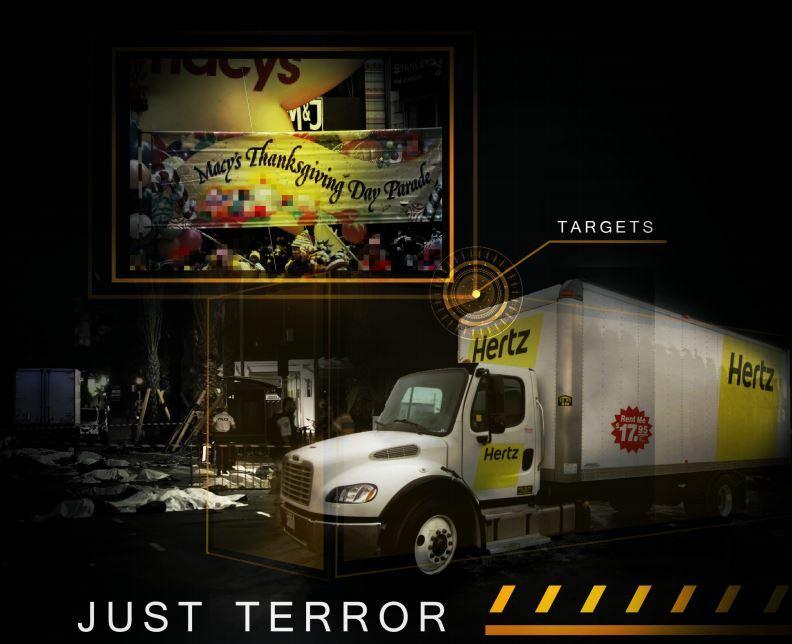 The article proves practical information on choosing the appropriate vehicle and target, specifically crowded areas and celebratory events, while the graphics used suggest the annual Macy’s Thanksgiving Day Parade in New York City on November 24 as an ideal target. Overall, given the symbolic nature of Thanksgiving as well as the fact that it provides numerous such targets for attacks, we assess that there is a credible risk for an IS-inspired lone-wolf attack on this day. This may take the form of a vehicular attack, but other methods, such as shootings and stabbings are also possible. While the famous and well-attended parade in New York City is an exceptionally desirable target for a successful attack, other smaller celebrations in cities and towns throughout USA face a similar risk. Those operating or residing in the USA are advised to maintain heightened vigilance in the vicinity of large crowds and celebratory events related to Thanksgiving, while being cognizant of suspicious packages, individuals, or movement. 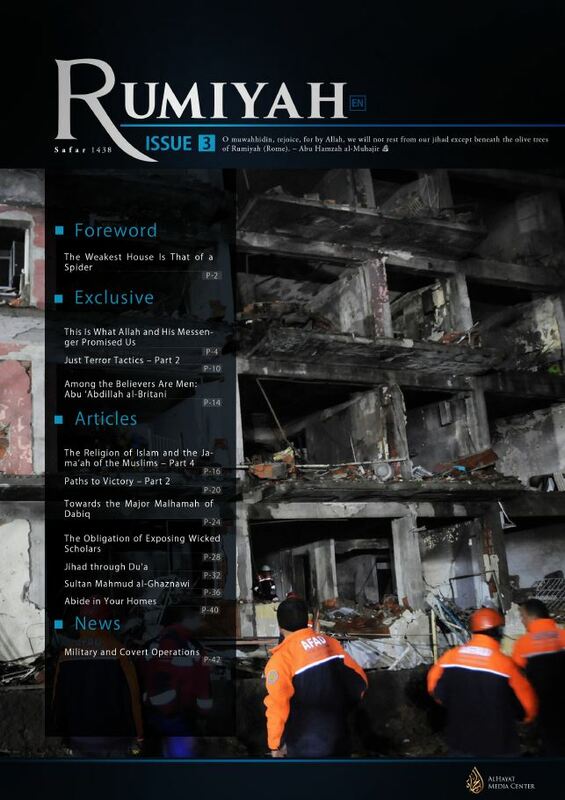 In their November publication of Rumiyah Magazine, the magazine’s third and latest publication, Islamic State (IS) dedicated an entire article to encouraging followers and supporters to carry out lone-wolf vehicular attacks, specifically referencing such an attack conducted in Nice on Bastille Day in July of this year, killing 86 and injuring 434. In the article, titled “Just Terror Tactics – Part 2”, the writer elucidates on the type of vehicle to use, the types to avoid, as well as ideal targets, and advice for planning such an attack. In this context, the article repeatedly advises the use of a large, but controllable, load-bearing truck, with adequate speed, and double-wheeled “giving victims less of a chance to escape being crushed”. The author also advises a metal outer frame, and a raised chassis to allow for “mounting of sidewalks or the breaching of barriers”, among other specifications. Regarding targets, the article suggests “large outdoor conventions and celebrations”, “pedestrian-congested streets”, outdoor markets, festivals, parades, and political rallies, while featuring pictures of the annual Macy’s Thanksgiving Day parade in New York City. 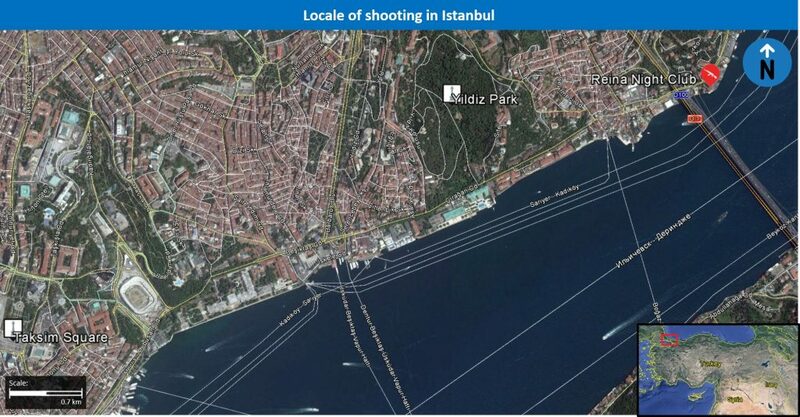 In addition, the article provides advice on preparation and planning for such an attack, namely “mapping out the route of the attack” and “surveying the route” for possible obstacles, cautioning that “more obstacles might be set up on the day of a targeted event”. The “Preparation and Planning” section also suggests attaining a secondary weapon if possible. Finally, the article concludes with a reminder, seen in previous such publications, that the assailant should find a way to announce his/her allegiance to Islamic State, such as by writing such statements on pieces of paper, and throwing them from the window of the vehicle during the attack. Third Consecutive Rumiyah Magazine with article on lone-wolf attacks: The aforementioned publication is notable for several reasons. For one, this is third consecutive issue of Rumiyah magazine that deals extensively with the issue of lone-wolf attacks. The first such article, titled “The Kafir’s Blood is Halal for You. So Shed it” dealt extensively with the theological justification for carrying out attacks against any non-Muslim, even innocent civilians. The second article is very similar to “Just Terror Tactics – Part 2”, but gives guidance on carrying out stabbing attacks as opposed to vehicular ones. An Easier Path to ‘Martyrdom’: Overall, the fact that three issues of Rumiyah feature articles encouraging lone-wolf attacks highlights the shift started by IS and previously observed by MAX in our special report on lone-wolf attacks, specifically the relative ease by which an individual can attain “martyrdom” status. 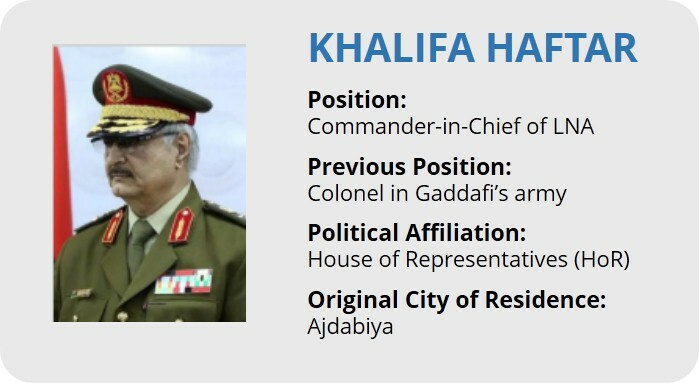 Compared with the past, this was a lengthy process, requiring patience, vetting, and more direct connections with Islamist networks. It should be noted that many “lone-wolf attacks” over the past year were not entirely lone-wolf, as attackers were in contact with members of IS via different messaging platforms through which he would declare his allegiance to IS and send a video of himself doing so. The “Just Terror Tactics” articles make things even easier by explaining how one can pledge allegiance to IS without needing to make any connections or even have to navigate the often complicated web of chat groups in these messaging platforms. Evolution of the Message: Furthermore, through these “Just Terror Tactics” publications, IS has illustrated its adaptability, evolution, and learning from their successes and failures. In this context, the first article included a lengthy religious justification for attacks in order to dispel concerns among some potential supporters that such assaults are not permissible in Islam. The following two articles focus on specific advice for carrying out these attacks and illustrate the group’s efforts to evolve what was once an open, unspecific call for attacks against whom they consider non-Muslims, to more specific instructions on how to do so in order to have the greatest impact. Thinly-Veiled Threat for Thanksgiving Day: Finally, it is noteworthy that the article featured two images from the annual Macy’s Thanksgiving Day Parade, while calling for attacks against celebratory events and parades and referencing the attack on crowds celebrating Bastille Day earlier this year. While the article at no point mentions the parade in particular, the details of an ideal target, and the graphics depicting the event appear to encourage followers to attempt an attack against the parade. This is further highlighted by the advice on how to survey a site prior to attack, and taking note of security barriers. Much like Bastille Day is symbolic for France, Thanksgiving Day and the associated parades are also very symbolic for the US. Forecast: While Islamic State’s general and standing call for attacks in the West has gained some level of adherence, with numerous lone-wolf attacks and attempted attacks being carried out over the past year, there has not been a direct correlation in time between these calls and the conducting of attacks. With this in mind, we assess that in addition to the standing threat of lone-wolf attacks worldwide, there is a further credible risk of such attacks in the US on Thanksgiving. Although the the Macy’s Thanksgiving Day Parade is an especially symbolic target, any parade or celebration faces a risk, even in small towns and cities across the country, as proximity and ease appear to be equally, if not more, influential aspects of a potential target. Furthermore, while the most recent publication calls for vehicular attacks and advises on how to attain a vehicle, should an attack transpire, a stabbing or shooting modus operandi is still a high probability given the added simplicity. Finally, it should be noted that while security forces will likely set up a perimeter around main events, an assailant need not reach this target in order to achieve the desired affect, and the security lines to enter a given event are equally probably to be targeted, given the sizeable crowds that result from them. Who ever thought that a day at the office would have to be a day spent thinking about the possibility of terrorism, in addition to the normal demands of business? Probably not most employees of Multinational Corporations doing business in far-flung corners of the globe. While MNCs have always maintained operations in volatile countries and regions, it’s simply an inescapable reality today that the potential for violent extremism has never been greater – and few targets are as appealing to a terrorist as an MNC. That means that employees can never let their guard down, and neither can the companies responsible for both employee safety and security, and business continuity management. While the country’s Jubilee Alliance of thirteen smaller political factions represents a sweeping effort to unite the often fractious nation and consolidate President Kenyatta’s power, it shows little chance of ending violent political and tribal opposition anytime soon. For the many MNCs doing business in Kenya, typically headquartered in Nairobi or Mombasa but with operations throughout the country, safety and business continuity threats ranging from militancy to crime, civil unrest, and other disruptions are an ongoing concern. Both al-Shabaab, the notorious perpetrators of the 2013 mass killings at Kenya’s upscale Westgate Mall, and IS remain active in recruiting and training Kenyan youths for extremist violence, and the threat of future attacks persists. The caveat is, they need to ask the question and find the answers not only in the thick of crisis, but also well before. You can’t really separate the issue of employee safety from business continuity, or vice versa. The one depends on the other, and the only way to ensure that they are both adequately safeguarded is to provide comprehensive employee security awareness training. Typically for MNCs, that entails enlisting the expertise of knowledgeable consultants, who then tailor employee training sessions to the specific site and circumstances of each office in order to localize the training around specific risks and the most likely business continuity scenarios. The training is site-specific and classroom-based, and is augmented by not only movies, PowerPoint presentations, discussions and lectures, but also by classroom drills and simulations to provide experiential learning as well as academic context. Experts such as MAX Security’s Mr. Ital Dar emphasize that such realistic simulations are critically important in preparing employees to know how and when to respond to a perceived threatening situation. By definition, and by their very nature, terror attacks come quickly and unexpectedly, but it is still possible – in fact necessary – to prepare employees with the tools and experience to assess even the most fluid situation as it happens and make level-headed decisions based on their prior training and planning. While the particulars of a training regimen should always be tailored to each company and location, a broad outline of topics that need to be addressed can apply to MNCs operating in any location that a heightened terror threat is present. 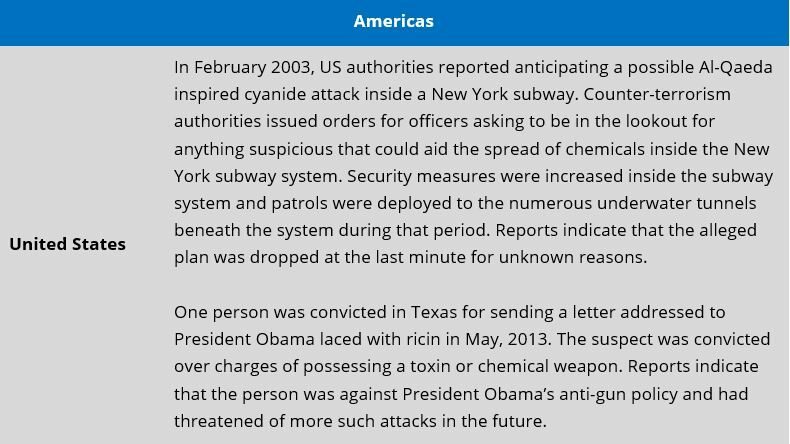 These include delving into relevant threat scenarios, assessing the location of an attack and reacting accordingly to minimize loss, and using the facility itself as a defensive resource, as when a shooting is occurring in one part of the building. Additionally, and again at an experiential level, training should focus heavily on how to plan for an attack or other threat before it occurs. In such a training module, employees work toward devising a response plan that incorporates clearly defined crisis management and emergency response goals and roles, and then they effectively deconstruct and reconstruct the plan in a tabletop exercise in which they identify and rectify any gaps and missteps in the original plan. Whatever other topics are covered in the training sessions of any particular MNC, the issue of business continuity management remains central, of course. For that reason, no security awareness training is complete if it doesn’t look to post-event issues and actions, as well as pre-event planning and training on how to respond in the moment. As soon as an event subsides, the aim of any business has to be to return to normal operations as soon as possible. Advance training, planning, and role-playing is an essential tool for meeting those challenges as well, including hands-on exercises that help to identify possible snags and anticipate optimal solutions for if and when they arise. It’s an unfortunate fact of life that no business – certainly no MNC operating in a volatile land – can take security for granted. Not in the 21st century. And not in a country like Kenya, where deep-seated political rivalries, tribal and ethnic divisions, persistent war and terrorism in neighboring states, and the unwelcome presence of some of the most destructive terror groups in the world today, make threats to business operations a very real and present danger. Against that backdrop, MNCs are likely to conclude that high-quality employee security awareness training is one of the best tools they have at hand to reduce the always-present threat to business continuity. Read more posts like this in our Security Blog. • Duterte’s first months in office have shown unprecedented, domestic support for policies such as anti-crime and anti-drug campaigns while putting serious strains on much of the country’s foreign relations. • The anti-crime and anti-drug campaigns are likely to continue in the coming months, despite internal and external criticism of the methods of execution. • Militancy will persist in the Philippines with an elevated risk of attacks in major northern cities; Abu Sayyaf likely to be driven out of Sulu stronghold. • Finally, the unpredictability of Duterte’s policy could deter foreign investment over worries about financial security, having a negative effect on the country’s markets and economic situation. • Travel to Metro Manila may continue at this time while adhering to standard security protocols given the latent threat of militancy, crime, and unrest. On June 30, Rodrigo Duterte was inaugurated to become the Philippines’ 16th president, becoming the first Premier to come from the restive island of Mindanao. Running mainly on a campaign of strong anti-crime and corruption policies, a vote for former Davao Mayor Duterte was widely seen as an act of protest against the perceived stagnant and corrupt politics of the longstanding Manila elite, as well as a symbol of frustration over the country’s continuing problems with rampant crime and drug addiction. Duterte’s campaign promised a number of bold and popular governing strategies, at the core of which was his pledge to end crime in the country within six months, primarily by attacking the drug market, most notably based around ‘Shabu’, a local name for crude Methamphetamines. Duterte’s promise to end all crime was considered substantiated by his claims that, under his command, the city of Davao had become the safest city in the country, with a substantially depressed crime rate. Additionally, Duterte positioned himself as a strong symbol of national pride, promising to stamp out militancy in the Islamic State-supported Abu Sayyaf stronghold of Sulu, and refusing to be perceived as placating to international powers who criticize his policies, particularly the US. Duterte’s anti-militancy push began with a campaign focused on making peace with communist insurgents in the south, and rebuilding Autonomous Region of Muslim Mindanao (ARMM), while working on completing the peace process with a number of moderate Muslim groups in the region initiated by previous President Benigno Aquino III. However, following the failure of Manila’s unilateral ceasefire on July 25 with the communist rebels after just one day, and continuing Abu Sayyaf activity in the south, Duterte began to increase his commitment to military activity to end militancy in the region. The threat of such operations was fairly successful in coaxing the communist groups Communist Party of the Philippines-New People’s Army-National Democratic Front (CPP–NPA–NDF) to the negotiating table, however, have led to an increase in Abu Sayyaf militancy in the south. Particularly, Armed Forces of the Philippines (AFP) pushes against Abu Sayyaf held territory on the islands of Basilan and Jolo were cited as one of the reasons for the September 2, Davao City bombing. The Davao attack on September 2 was one of the most significant to occur in the Philippines in recent years for a number of reasons. Firstly, the attack occurred in an urban center and one of the Philippines most developed and important urban areas, the city of Davao; secondly, the attack happened amid increasingly and ostensibly successful counterinsurgency operations on the Abu Sayyaf stronghold of Sulu; finally, the attack, one of the bloodiest in a number of years, occurred under the watch of one of the Philippines’ more security focused presidents. The significance of the attack taking place in a major city and coming amid the increasing AFP operations in the Sulu Archipelago are closely linked to the motive of Abu Sayyaf in carrying out the attack. 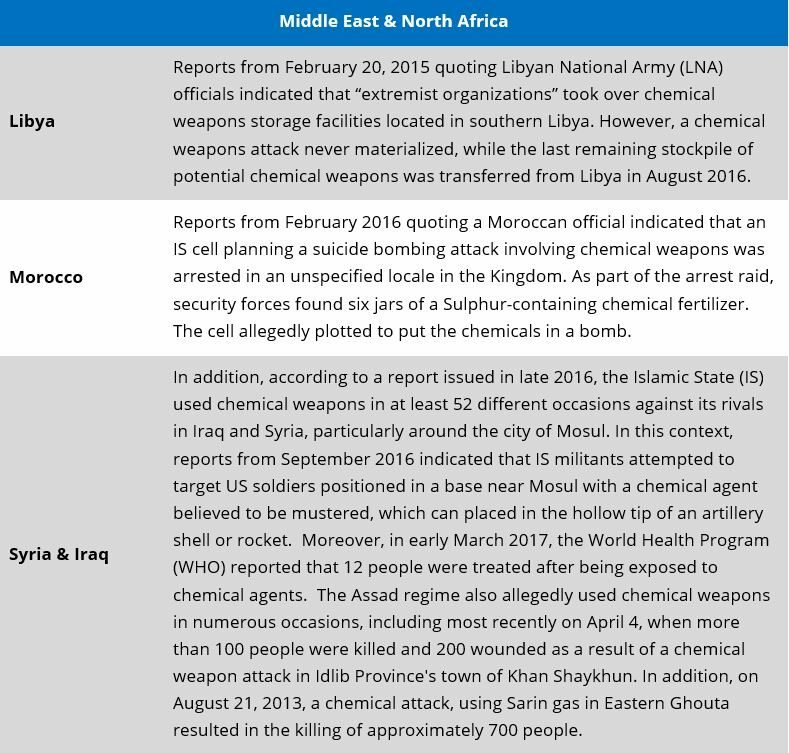 The tactic of attacking civilian centers when losing territory formerly held by the group has become a relatively common modus operandi for the Islamic State and groups affiliated with the global jihadist organization. 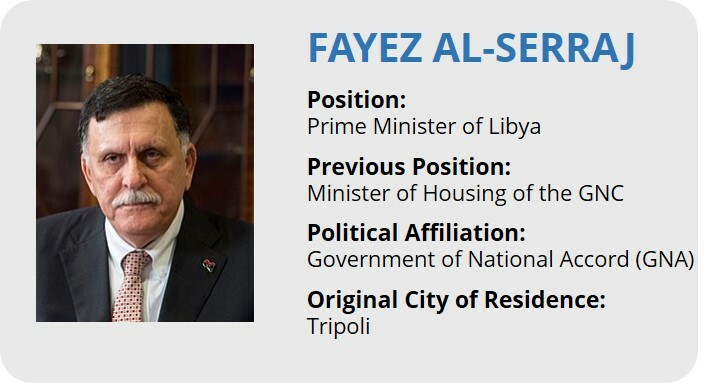 Such a tactic serves two purposes; first of all, it projects high levels of operational capabilities toward the government and public, illustrating the militants’ ability to conduct attacks in civilian hubs, not just in the often sparsely populated territories held by many IS affiliated groups. Secondly, it succeeds in panicking the public and encouraging fear of the militant group, which subsequently increases instability in the country as a whole, as questions over competent leadership emerge, and divisions grow over the correct way to handle the attacks. While the Philippines have been involved in an internal conflict with Muslim Moro rebels in the south for decades, they have seen very few attacks in major Catholic cities, outside the island of Mindanao. With this in mind, a shift by Abu Sayyaf to start frequently targeting major cities and tourist hubs, particularly Manila, would likely cause high levels of panic across the country, and a crisis of confidence in the President, the military, and the operations in the South. 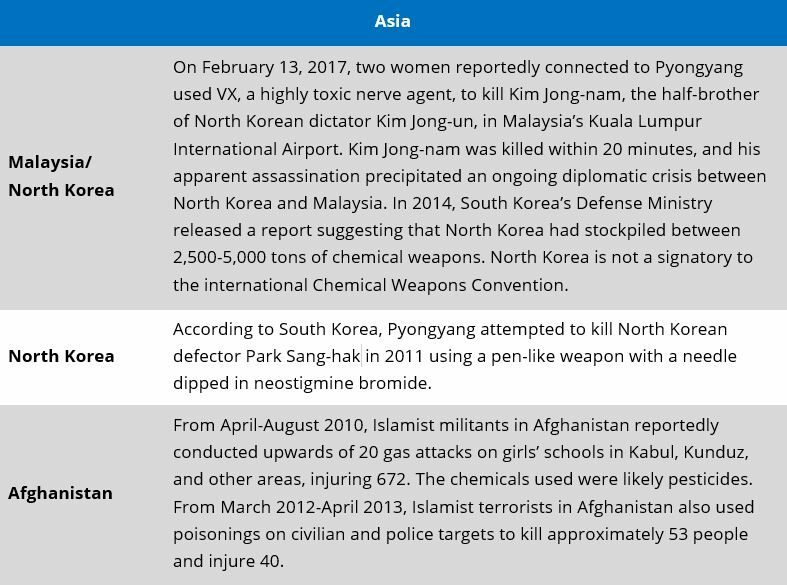 Furthermore, we assess that additional Abu Sayyaf attacks are possible in major cities in the coming months as the group attempts to further capitalize on the aforementioned sentiments. Additionally, the possibility of increasing attacks on major urban centers in the Philippines has the potential to seriously hinder Duterte’s support among the public. While Duterte remains extremely popular, his controversial governing technique remains tied to his ability to achieve results in a way that helps the lower socioeconomic classes he campaigned on serving. In the event that his contentious criminal campaigns and novel relationship with the constitutional law are unable to guarantee the safety of the people or perhaps even contribute to the deterioration of the country’s security situation, his constituents will be far less likely to accept such turbulent policies as he has put forward in his anti-drug campaigns. A string of future urban attacks, particularly targeting Manila, would likely bring into question whether or not Duterte’s municipal governing technique applied to the city of Davao is adaptable to a national level, with so many more groups with unique interests and dynamic aspirations. This was already illustrated on a smaller scale by the President’s misjudging of the complexities of the communist insurgency when he declared a unilateral ceasefire with the CPP–NPA–NDF, which was promptly followed by a communist attack on AFP personnel. The handling of the militant situation in the country’s south will stand as the first and most important test of Duterte’s leadership to date. 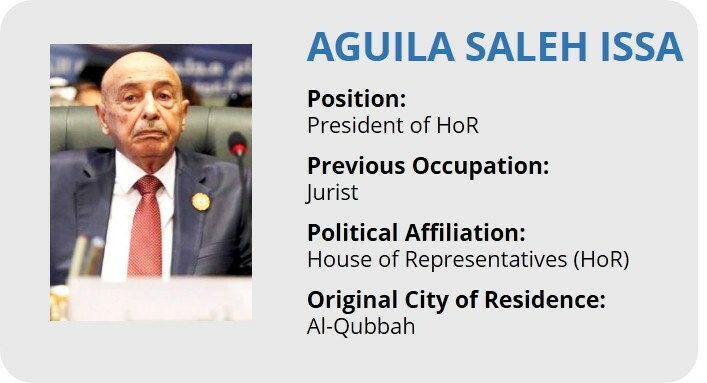 FORECAST: Duterte’s campaign against Abu Sayyaf is not likely to succeed totally, just as former President Joseph Estrada’s campaign was unsuccessful in totally eliminating the threat from the IS aligned group. Additionally, considering IS instructions to carry out attacks across Asia and the increasing militant recruits who will join following an IS call for followers to travel to the Philippines, more attacks can be expected. These attacks will take place primarily around the southern island of Mindanao, with additional instances targeting major cities in the northern island groups of Luzon and Visayas, particularly targeting areas such as Cebu and Metro Manila, as well as popular international tourist locales such as Boracay and Palawan. This is especially the case as Abu Sayyaf militants flee the fighting in the Sulu Archipelago and begin to regroup elsewhere, on the Philippine island of Mindanao, as well as the Malaysian island of Sabah. 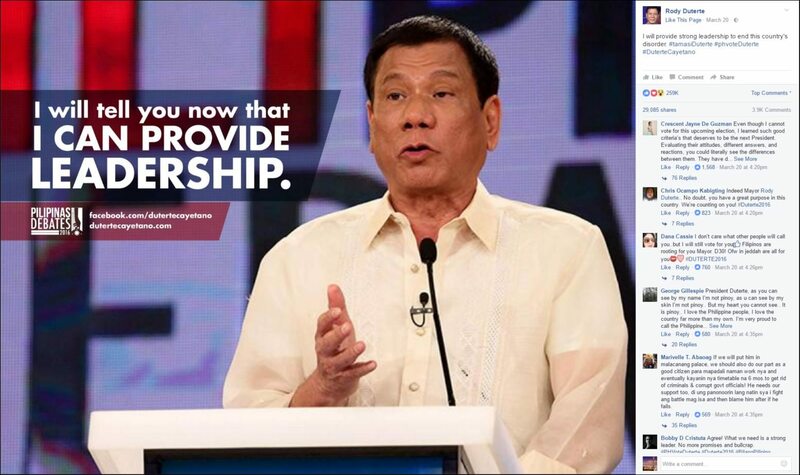 The methods through which Duterte has pursued his policies of strong anti-crime and anti-militancy campaigns have mostly manifested in a relentless commitment to seemingly pragmatic, ends-justify-the-means strategies, which often circumvent traditional governing and policing practices, as well as checks and balances, in place of populist, common-sense offensives. These methods involve awarding sweeping powers to police and military forces, and by-passing political and judicial checks. In terms of the drug campaign, this has manifested in a police carte blanche to shoot-on-sight anyone suspected of being involved in the narcotics trade. The controversial decision to encourage the extra-judicial killing of individuals linked to the narcotics trade, particularly drug dealers and drug addicts, has subsequently brought about a dramatic increase in reported killings in major cities across the country. 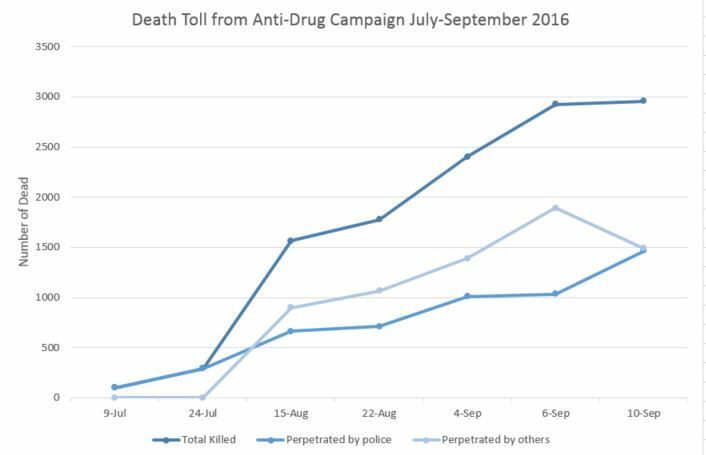 Although the numbers cannot be independently verified, official police statistics indicate that around 3,000 people have been killed in the drug operations since Duterte took office on June 30, both by police and civilians, while an additional 5,400 were arrested and 565,805 dealers and users surrendered to police, to date. At least half of the killings are believed to have been carried out by civilians. Nonetheless, the Director-General of the Philippine National Police, Ronald dela Rosa, stated that crime rates had fallen by 49% since the President took office. Duterte’s unique and harsh approach to the drug problem in the Philippines, although highly controversial on the international stage, appears to be, for the most part, successful when judged against its own objectives and intentions. Many have looked at the number of arrests and surrenders, as well as the incumbent government’s willingness to expose members of the establishment who were involved in the drug trade, and argued that in the short term the policies seem to be working. 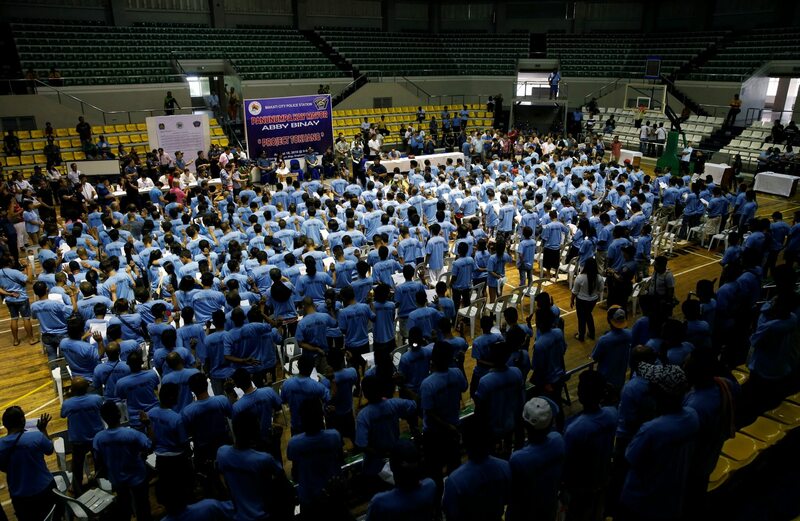 While it remains impossible to determine how many of the between roughly 3,000 dead were indeed involved in the drug trade, due to the lack of judicial proceedings, initial reports do suggest that the availability of drugs on the streets of Manila has notably decreased. That said, although such policies may seem pragmatic and necessary by Duterte’s supporters, given the scope of the problem in the country, it could be argued that they are in fact, short-sighted and detrimental to the country’s long-term stability. While the initial fear of the killings may help to decrease the number of drug dealers willing to risk their lives, and thus lessen the impact of narcotics in the short term, the overarching powers given to the police will have a harmful effect on the ability of the Philippines’ judicial system to properly function. Reports have already begun to emerge of police misusing their newly gained power for personal gains or to deal with interpersonal disputes, actions which will stand to lower the general public trust in legal authorities. Furthermore, although the de facto legal capacities of the security forces have increased, their salaries have remained the same, as of the time of writing, which remains one of the primary causes of corruption. Considering that the power of the police has increased, the oversight has decreased, and their compensation has remained static, we can expect that abuses of power are likely to increase, especially in the peripheral areas of Manila and major cities, where local police officers wield significantly more power. Such an increase in corruption by a police force which growingly views itself as immune to prosecution is liable to be very damaging for the general state of law and order in the country. Additionally, the current success of the anti-narcotics campaign is likely to encourage the executive to direct, and the public to support, the suspension or circumvention of legal statutes in other parts of governance in favor of policies which are deemed pragmatic and forthright in dealing with major issues. This culture of nonconformist governing has the potential to continually erode the rule of law in the Philippines, to be replaced with the cursory will of the country’s President to dictate as he sees fit, in the name of the nation. The consequences of such a governing style have already been hinted at by President Duterte, who, on a number of occasions, has threatened to disband congress if they disagree with his plans for the country, particularly with regards to law and order. Such a lack of consideration for the laws of the land, likely stemming from Duterte’s former work as a prosecutor in Davao, in which he became somewhat disillusioned with the corrupt and inefficient workings of the Philippine justice system, indicates a favor for authoritarian over constitutional rule. Duterte’s disregard for legal consistency and favor for diminishing oversight of security forces also increases the instability of the country for foreign investors and travelers. Without the insurance and security that is guaranteed through the ability to fall back on the rule of law to aid international businesses to interact smoothly with the government and private companies in the Philippines, the reliability of contracts and safety of investments cannot be dependable, vastly increasing the risk to international businesses. Moreover, the political culture of ignoring legal statutes and disregard for foreign partners, as has been shown by Duterte, has the potential to, on some level, be adopted as a model of international interaction by both public and private figures in the country. Lastly, increasing police corruption would further hinder the possibility of operations in the country, especially when the threat of drug accusations can be so easily used as an attempt to strong arm civilians by authorities. An issue which is further illustrated by the death of a British national on September 10, who was killed due to purported drug links and whose murder has yet to be investigated by authorities. FORECAST: Considering the centrality of such policy to Duterte’s campaign, we assess that the drug campaign will not relent, and on the contrary, is likely to increase in intensity with a possibility that the death toll will reach the high thousands by the year’s end. Furthermore, it is likely that police and non-government personnel will become decreasingly weary on who is targeted, possibly leading to significant numbers of dead without a trial. While the policy is currently popular and is likely to remain so, we assess that protests may occur if particularly controversial killings start to be reported on a regular basis, especially if political rivals of Duterte believe they can use such killings as leverage in their own campaigns. Furthermore, we believe that additional reports of foreign nationals being killed in the anti-drug campaign will arise, further distancing the Philippines from many of their allies. The Philippines’ international relations have taken a significant turn since President Duterte’s inauguration, with a number of statements on both bilateral and multilateral relations causing considerable tensions. During his electoral campaign, Duterte became well known for his outbursts of candid and often crude opinions, particularly on sensitive issues and directed at prominent public figures. The President was widely criticized for insulting the Pope and telling him not to visit the Philippines anymore. In the same vein, on September 6, a meeting between Duterte and US President Barack Obama at the ASEAN conference in Laos was canceled after the Philippines’ President used offensive language against the US President in a speech criticizing Obama’s plans to confront the issue of extrajudicial killings led by Duterte. Furthermore, the President has made a series of statements outlining his intentions to downplay the Philippine-US relationship and foster relations with China and Russia. After this, many prominent financial analytics groups reported significant drops in foreign investment in the Philippine Stock Exchange Index, which fell 4.48% between August 15 and September 16. Duterte’s policies with regards to foreign leaders are likely to become increasingly problematic in the future, assuming he retains his outspoken and blunt speaking and governing style. A cooling of relations between the Philippines and its top military and diplomatic ally, the US, could prove detrimental for the archipelago country, currently in the midst of a major island dispute with the People’s Republic of China. The US has given the Philippine government over 500 million USD in military aid since 2002, 79 million USD of which came in 2015 amid the ongoing South China Sea dispute. While Duterte’s comments are often enjoyed by his supporters, there also remains a major public support for policies which balance China’s attempts to build on the Spratly Islands and Scarborough Shoal. Any instances which are seen to hurt the Philippines’ position in the South China Sea, such as a reduction of US involvement, is likely to be received negatively by the electorate, especially if it plays into China’s advantage. Furthermore, polls show that the Filipino public has shown around 90% favorability towards both the US and Obama, further indicating that the distancing between the two countries would negatively impact the incumbent government’s popularity. Finally, Duterte’s uncompromising positions and unorthodox rhetoric have the potential to not only cause damage to the Philippines’ political relations but also to its global economic connections. Duterte’s comments characterize an unpredictable leader, who has little respect for a convention in either the governmental or international arena. This is likely to have a further direct effect on the markets, as was already witnessed in the aftermath of the comments about President Obama and the US. If investors start to believe that the policies of Duterte are erratic and that the Philippines no longer remains a stable environment for foreign investment, the economy could begin to stagnate or dip. In this regard, it could be argued that while previous Presidents looked to retain the status quo, while not addressing some of the country’s domestic issues, the current president is focused on domestic issues, in a way that could threaten the country’s foreign relations, both in the political and economic sectors. The further distancing of the Philippines from the West has the potential to push the country towards other major regional players, such as China and Russia, who Duterte has expressed a willingness to open up to, a move that would likely seriously affect trade with both the US and Japan, the country’s two main trading partners. FORECAST: In terms of the Philippines perception abroad and the country’s relations with the US, aside from any major shift in policy from the international community, Duterte’s government is likely to continue to attempt to downplay its connection to the US and warm relations with China. This may see significant negotiations taking place in the South China Sea, economic and trade deals, or diplomatic moves in an attempt to shift Manila’s allegiances towards Beijing. While the Philippines is unlikely to make any major moves to break its relations with the US, continuing comments by the Philippine President will occur, highlighting his strained relationship with the Asian archipelago’s former colonial power. Finally, such issues will further deteriorate trust in the Philippine economy abroad, having detrimental effects on its foreign investments and general economic development. Those operating or residing in the Philippines should minimize contact with police and security authorities, due to the prevalence of corruption increasingly wide range of powers given to police officers and lack of due process with regards to criminal procedure. When possible it is advised to seek private security while traveling throughout the country. Avoid all travel to the western part of the island of Mindanao, as well as the Sulu Archipelago and avoid nonessential travel to the island, including Davao City, given the risk of militant attacks. Minimize travel to known touristic sites throughout the country, as well as government installations and prominent national symbols, given the elevated risk of militant attacks targeting Western nationals. Hey Buddy!, I found this information for you: "Philippines Special Analysis Report: 90 days after Duterte’s inauguration, crime rate lowers, militancy persists, international relations waver". Here is the website link: https://www.max-security.com/reports/philippines-special-analysis-report-90-days-after-dutertes-inauguration/. Thank you.